I hope you all had a wonderful Christmas! We did all-around, including yesterday when we had a glee marathon and KD and I never even got out of our p.j.’s. We feasted and gifted and spent time with our families; I also sent text-love to all of my bff’s. I love technology. 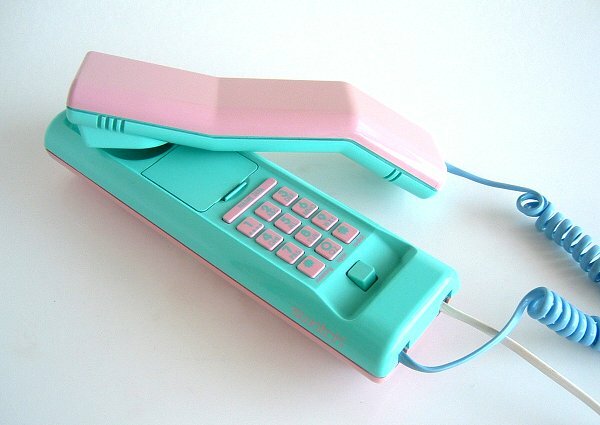 I wonder what I would have said if I could only call the girls from Steph’s teenline (via her Swatch phone)? Most likely, I would’ve said “let’s call 1-800-Tampax” which was one of our fave pranks to do circa 1990. I'm not sure if this was Steph's or if she had the clear one. Beautiful gifts had already been opened, though, so we HAD to check FB, msgs and WWF before we finished dinner prep. Seriously, Mel totally out-did me with the wrapping. I’ll show you that and what she made us this week. Lori just gloated by sending me a picture of the Magic Kingdom, lit up for Christmas. Seriously, that’s just mean. I felt like gloating, myself, when she texted me this morning and complained that she didn’t want to leave FL. Cry me a river, Lor. Evidently she didn’t have time to stalk down Casey Anthony like I asked her to, so they must’ve had a great time.